If you would like to run the Virgin Money London Marathon on 26 April 2015 to support people affected by lupus, don’t forget to enter the public ballot for a place when it opens on Tuesday 22nd April 2014. 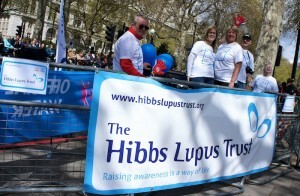 If you get a place through the ballot and choose to raise sponsorship for The Hibbs Lupus Trust, we’ll support you all the way! We will send you a running vest/tshirt & lots of running tips! You’ll also be able to download our free iPhone application to track your training and share your fundraising links!